Oxford University researchers who were trying to reproduce in the lab a notorious type of wave known as a Draupner wave, or rogue wave, said they were surprised to see the pictures bore an eerie resemblance to an iconic painting of a wave by the great Japanese artist Hokusai. Rogue, or freak, waves are unexpectedly large, difficult to predict, and considered the likely suspects in many maritime disasters, the university said in a statement. One of the first confirmed observations of such a wave happened on Jan. 1, 1995, in the North Sea, by measurements made from the Draupner Oil Platform, the university said. 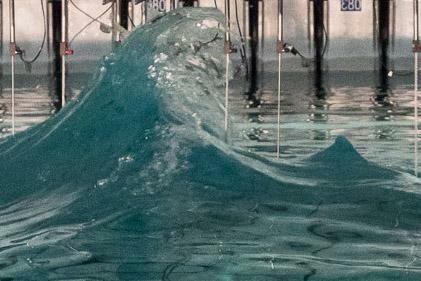 Oxford researchers set out to recreate the wave at a lab at the University of Edinburgh. They were able to do it by using two smaller wave groups and varying the crossing angle, the university said. They found that 120 degrees was the key angle. ‘The measurement of the Draupner wave in 1995 was a seminal observation initiating many years of research into the physics of freak waves and shifting their standing from mere folklore to a credible real-world phenomenon. By recreating the Draupner wave in the lab we have moved one step closer to understanding the potential mechanisms of this phenomenon,” Mark McAllister, of the University of Oxford’s Department of Engineering Science, said in the statement. The researchers, who published their results in the Journal of Fluid Mechanics, hope that the study could someday lead to a way to predict the fickle, but potentially deadly waves. Now for the artsy part: The wave they produced resembled photographs of rogue waves in the ocean, the university said. It also was nearly a dead ringer for “The Great Wave off Kanagawa,” also known as “The Great Wave,” a woodblock print published in the early 1800s by the Japanese artist Katsushika Hokusai. The piece is one of the most famous images in Japanese art. Hokusai (1760-1849) was the first Japanese artist to be internationally recognized, according to Boston’s Museum of Fine Arts, which has one of the prints. 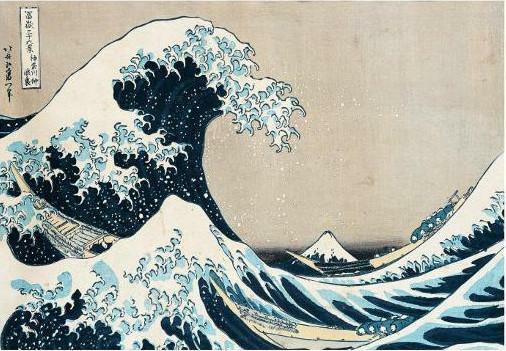 Hokusai’s wave is believed to depict a rogue wave, the university said.